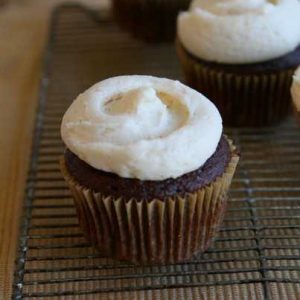 I made some cupcakes for a friend and thought it might be a good time to try a new buttercream recipe! So I hunted the internet and came upon this one from Sugarcrafter.net. But then I only had 2 tbsp of butter in my fridge (which is pretty much the worst thing that can happen to me) so I had to modify it. Honesty, if you are going to make it I would start with Tracy’s beautiful recipe. Because even though I adore my silly adaptation of it, I have a feeling hers is Gold. Gold I tell you! 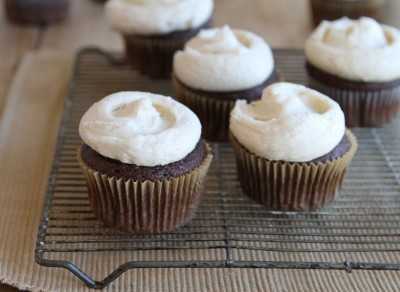 I started with these amazingly delicious chocolate pumpkin cupcakes. 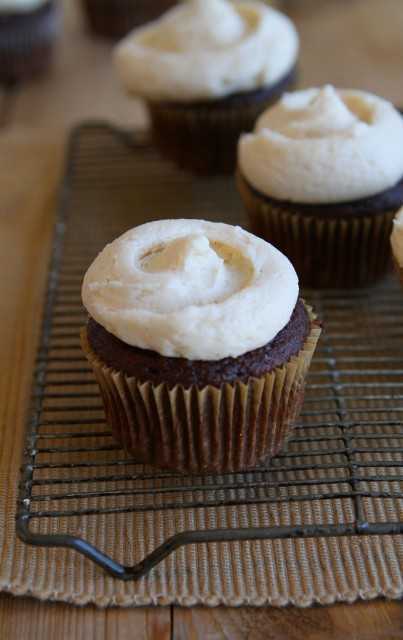 Then progressed to a beautifully sweet pumpkin spice buttercream. Add pumpkin puree and cinnamon and blend for 30 seconds. Add milk in when you need too, probably after second cup of powder sugar. Add a little at first and then more as needed. 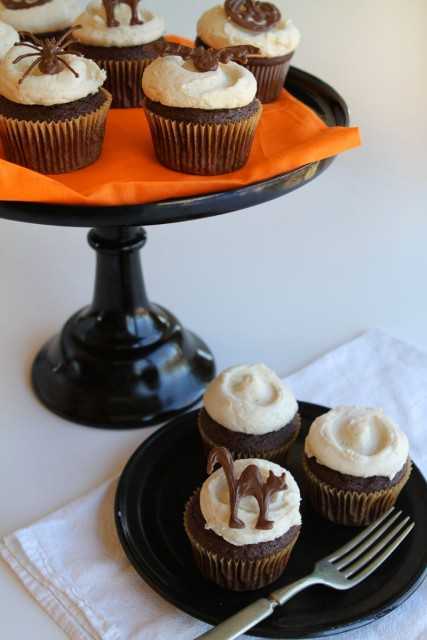 From here I wanted to add a fun seasonal embellishment… so I decided to throw some Halloween inspired chocolate treats on top! Draw your design onto a piece of paper with a Sharpie or dark marker. Melt some chocolate in a pastry bag. 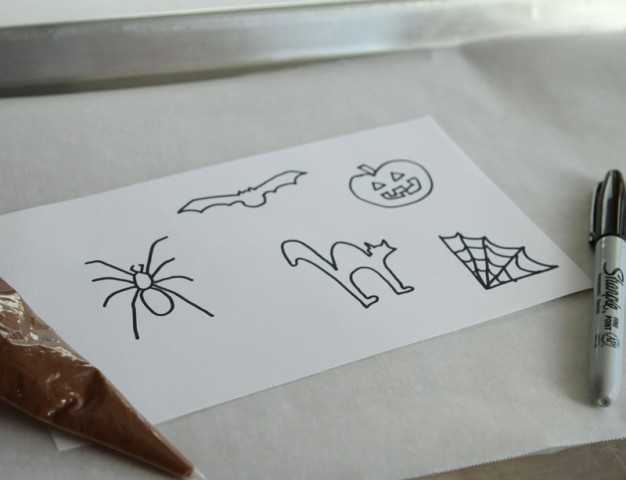 Slip the paper behind a piece of parchment (or wax paper) and pipe melted chocolate over the drawing. Let sit for a couple hours or pop in the freezer for two minutes. Then simply place on your cupcake! 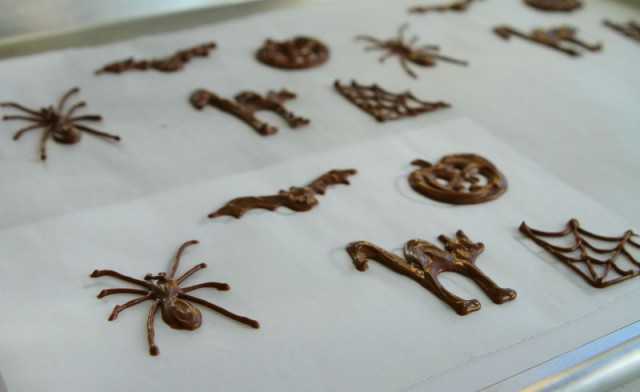 I recently asked some of you brilliant bakers about your favorite frosting’s… if you want to weigh in or just see all the decadent and delicious options shared, just visit the iambaker facebook page! Adorable, adorable, adorable! I especially love the spiderwebs!!! Okay, I made them last evening. I am not an especially good baker, as my husband will attest. When he tasted these, he was in disbelief. These are possibly the best cupcake I have ever tasted let alone made. The frosting with the cinnamon and pumpkin made it especially interesting! Great recipe! Thank you so much for making me appear to be a baker! I love your handmade toppers, and they really seem easy to do. With Shelly’s comment above / rave 🙂 I’ll have to give the recipe a try too! Your Magnolia swirl is pretty perfect!! oh my those look so delicious! Their top turned out all flat and the white cream on top gives it an elegant touch. I love how you made the Halloween decoration! I think yours turned out better though!